Photos courtesy of their respective companies. Sun Valley Resort brought Hollywood glam to small-town Idaho when it opened on December 21, 1936. The country’s first destination ski resort attracted movie stars, Olympic hopefuls and visitors from around the world, but the little towns of Hailey and Ketchum stayed true to their ranching and mining roots—sheepherders and their border collies still trail sheep through Ketchum on the way to winter pasture, chefs are putting an international spin on local ingredients, and there’s hardly a chain store in sight. Arriving by plane wasn’t quite as grand as arriving by the train from Boise like some other guests, but with an early flight, a short stopover in Salt Lake City, and a time zone switch, I landed just in time for lunch. No expense was spared when Sun Valley Lodge was built. Enormous windows in the lobby and second floor lounge immediately pulled me toward views of the outdoor ice rink and surrounding mountains. My room, filled with French oak furniture and rich floral patterns, had the same elegance and warmth that the lobby promised. Photos of Lucille Ball, Gary Cooper, Picabo Street, Kristie Yamaguchi and hundreds of other stars lined the hallways and kept me wandering, eventually leading me to the spa, the bowling alley and the outdoor heated pool. Skiing is the main attraction here, but dazzling outdoor ice shows, sleigh rides and a village full of shopping and dining options make it difficult to stay on the slopes all day. Looking for convenience just a few blocks from downtown Ketchum, I found a sophisticated spin on comfort at the Knob Hill Inn. When new owners remodeled a couple of years ago, guests got oversized tubs (complete with bowls of bath salts) perfect for soaking on cold nights, walk-in showers, radiant floor heating, and an expanded complimentary breakfast bar (try the breakfast pizza and fresh muffins). Touches of rustic iron and wood accent the sleek brown and gray interiors, the rooms are large, views of Bald Mountain are stunning, and the staff bend over backwards to make you feel at home. For a crash course in local sheep ranching and skiing culture, pop into the Ketchum Sun Valley Heritage and Ski Museum. Ketchum’s most famous resident, Ernest Hemingway, spent the fall here for many years, leaving bits of his legacy all around town. Look for him in the back room/vault of the Visitor’s Center (photos and a desk), a nice display in the library, his memorial at Sun Valley Resort, and his grave in the cemetery. 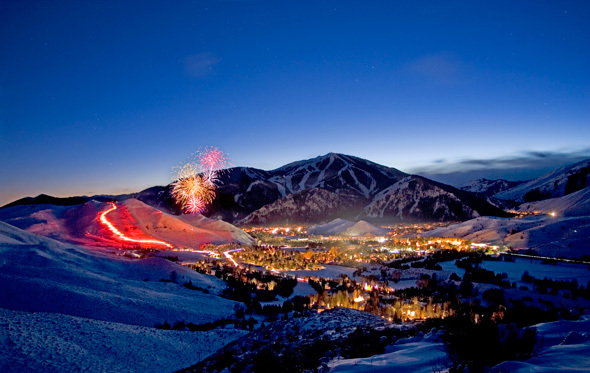 Sun Valley has a vibrant arts community, and downtown Ketchum is filled with galleries and public art projects. Internationally known contemporary artists, traditional western painters, and even indigenous Australian artists are all well represented here. Sun Valley Center for the Arts and the NexStage Theatre offer a continuous stream of exhibits, plays and cultural events that will appease even hard-core culture vultures. If you’re looking for bargains and vintage treasure, several consignment stores and the Gold Mine Thrift Store are filled with quality clothing and household goods. Deja Vu specializes in estate jewelry and vintage couture, but be prepared to pay top dollar. Get a massage or any other service at Zenergy, and the place is yours for the day, including a heated swim-out saltwater pool, eucalyptus steam room, indoor tennis, and drop-in yoga and fitness classes. Zenergy recently doubled their size, and with 48,000 square feet of health and wellness treatments, you could spend your entire trip blissing out. Shorty’s Diner. Packed with Beatles, Elvis and other ’50s memorabilia, this Hailey breakfast and lunch spot serves everything from huevos rancheros to lox and bagels. Try the cinnamon French toast with a corn flake crust, and don’t leave without tasting Shorty’s thick, but very tender bacon. CK’s Real Food. Chris Kastner already had a large Sun Valley following when he opened his own space in Hailey. Combining his love of world cuisines with locally sourced ingredients, Chef Chris keeps his menus fresh and eclectic. Snake River Kobe beef, antipasti hummus, and lamb vindaloo are just a few of many surprises in his constantly growing repertoire. Enoteca. 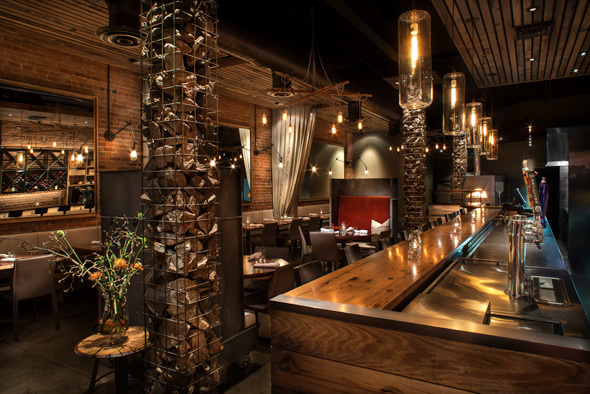 Modern industrial décor creates an intimate dining space in Ketchum’s historic mercantile building. Have fun pairing wood-fired pizzas, small plates of house cured meats, or Idaho trout and lamb entrées with a spectacular selection of Northwest, California, French and Italian wines. Michel’s Christiania. Ernest Hemingway had his own table in this cathedral of French cuisine. The menu offers classics like escargot and foie gras, as well as local lamb, trout and beef dishes. The wine list here is staggering, but the friendly staff and relaxed atmosphere will convince you to stay and try a few varieties.